Welcome to Marvel Strike Force Guides page. This is the full description of the MSF Challenges segment with all information regarding it. Hello, Marvel fans! 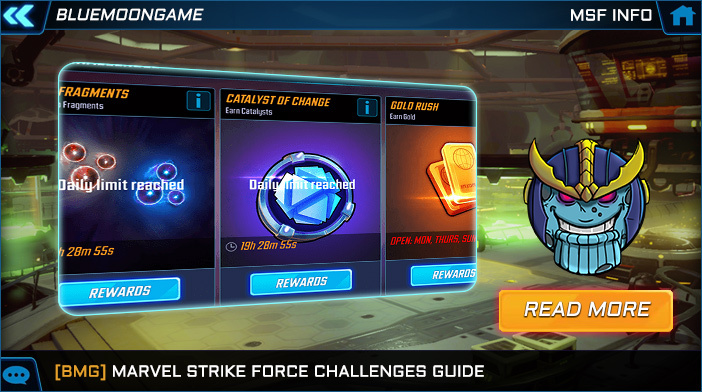 Today we will have a brief journey through Challenges, which is a very useful segment of Marvel Strike Force. Challenges are meant to test the power of the player’s team through several battles that gradually become more and more difficult, and award player with handy rewards on a daily basis. There are six different challenges and they arranged for different days in the week. Every Challenge has 9 tiers of difficulty except Catalyst of Change which has 7 tiers and every tier provide rewards depending on difficulty. Player has 3 attempts per day for each challenge that day, but only successful attempts are counted and if you fail to beat some tier of a challenge you can try again on lower tier without losing an attempt. If you win a battle without losing a single hero you are awarded 3 stars and every next attempt can be repeated through Auto-Win option but if you don’t have three stars you must manually win every fight again and again. During a week we have two challenges per day except on Sunday when all Challenges are open. This is all you should know about Challenges in Marvel Strike Force. Below you will find the table with Challenges schedule for each day of the week. Until our next meeting - be well and play Marvel Strike Force! We hope that you enjoyed the description of MSF Challenges segment. For detailed information about other MSF Segments check our MSF Guide page.